In recent times Nintendo has been releasing new trailers for Kirby: Triple Deluxe that show off the mascot's various characteristics, such as being mischievous or disturbingly powerful. The latest example taps into one of the pink ball's strongest abilities — super-duper cuteness. For those of us that love Kirby games, part of the appeal may be that playing the series' games is a little like being wrapped in candy floss before body rolling down a hill of the softest grass imaginable... or something along those lines. It's a series that, through goofy abilities and designs, clearly aims to make us smile. The latest trailer, below, shows that side of the series rather nicely. Check it out and, as a Saturday bonus, below that is a recent video for Rusty's Real Deal Baseball, too. No point in trailers. What would be good is a review of the Japanese version that has been out for ages. I hardly found anything cute. This looks like the best Kirby game in recent years. 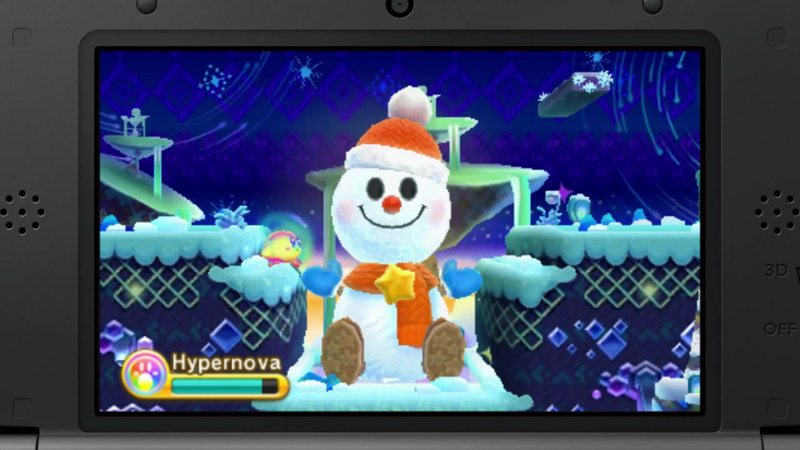 Return to Dream Land was kind of uninspired in my opinion, but this looks really good. He is the cutest! Darn these trailers. They just tease some more but here I am still waiting! @Giygas_95 Both Return to Dreamland and Epic Yarn got at least one 10 from Famitsu this didn't. Nintendo World Report only gave it an 8. http://www.nintendoworldreport.com/review/36445/kirby-triple-deluxe-nintendo-3ds - Seems like what you would expect from Wii engine on 3DS (LIke NSMB2 / DKCR etc). @unrandomsam Well, so to Famitsu Return to Dreamland was worthy of a 10, and to Nintendo World Report this was worthy of an 8. That's just their opinion. It doesn't mean RTD is automatically better than this. In my opinion, RTD is more worthy of an 8. It was good, sure, but it felt just a little uninspired to me. On the other hand, I may end up playing this and think it's worthy of a 9 or 10 (or I may not, who knows). Once we've played it, we can decide if it's definitely better than RTD or not. Also, the reviews of this and Return to Dreamland on Nintendo World Report were done by different people, so you can expect different opinions. @unrandomsam "Kirby Triple Deluxe (3DS) – 9/9/8/9"
Looks fun, will be getting this. "Nintendo Now Shows Kirby's Super Cute Side in New Triple Deluxe Trailer"
I've never played a Kirby game to completion so I'm looking forward to this one. So many good games for the 3DS! Nice trailer, but I can't call it really cute! As for the Rusty's baseball trailer: The Nontendo 4DS?! Lol!